A definite trend of 2012, was the profusion of watches launched, with blue dials. Blue was definitely en-vogue last year and when it comes to haute horology, I don’t see that immediately changing. I was a little surprised when I heard that Roger Dubuis was launching a further model into this competitive arena at SIHH 2013. However, one glance at this latest model and I am seduced by its original lines and sporty temperament. When I see a watch, which I feel is meritorious, I often vow to write about it in due course. I see little justification in wasting time writing about watches of little merit. I can’t be bothered bemoaning their deficiencies and trying to butcher reputations for comical effect. The opportunity cost in writing about the poor, plain, boring or badly flawed is to deny myself the chance to express admiration for a timepiece of great virtue. On seeing the Excalibur 42 Chronograph in steel, I immediately felt a compulsion to write. Songwriters often talk of looking for “a hook”; the germ of an idea which can be developed into a chart-topping hit. I confess to a similar approach to writing articles about watches. The warrior-like symbolism of Roger Dubuis’s promotional material and the name, “Excalibur”, lead me to rack my brain for a suitable link I could exploit. The blue dial and warrior-like status led to thoughts of Mel Gibson playing William Wallace in the film, “Braveheart”. However, I felt the link was somewhat tenuous and stretched artistic license beyond breaking point. I am defeated. I cannot think of a clever link, witty play on words or double entendre capable of doing justice to this stylish timepiece. I simply admire many aspects of its fabulous form, which coalesce to evoke adoration. I make no secret of my admiration for Roger Dubuis. The manufacture from Geneva has an immense capability in-house to make high precision mechanical timepieces of peerless execution. Moreover, all of their watches carry the Poinçon de Genève. This particular timepiece is interesting as it combines the complication of a chronograph, blue dial, Poinçon de Genève and a stainless steel case. I have reflected on this for a while and cannot think of another watch which shares all of these aspects. 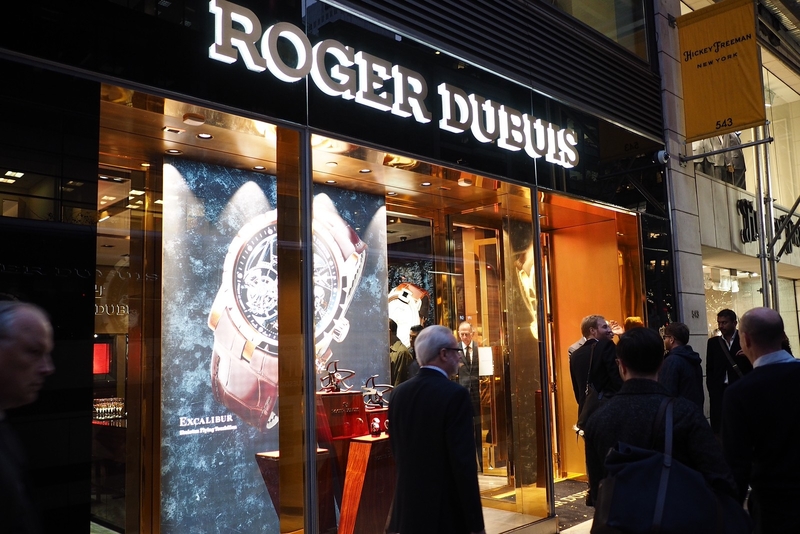 Perhaps Roger Dubuis have found a niche for itself, catching other brands unaware and their new model may very well prove to be one of the must-have timepieces of 2013. Blue has always been associated with luxury throughout history. It comes as no surprise that watch brands are now exploiting this regal tincture. The shade of the dial is masculine and highly wearable. It is not saddled with an unusual hue preventing daily wear. The sporting persona of the watch is ideal for both formal and casual attire. The elongated Roman numerals of former Excalibur models are retained. They are presented in grey and provide a pleasing contrast with the dial, conferring clarity with their elegant form. 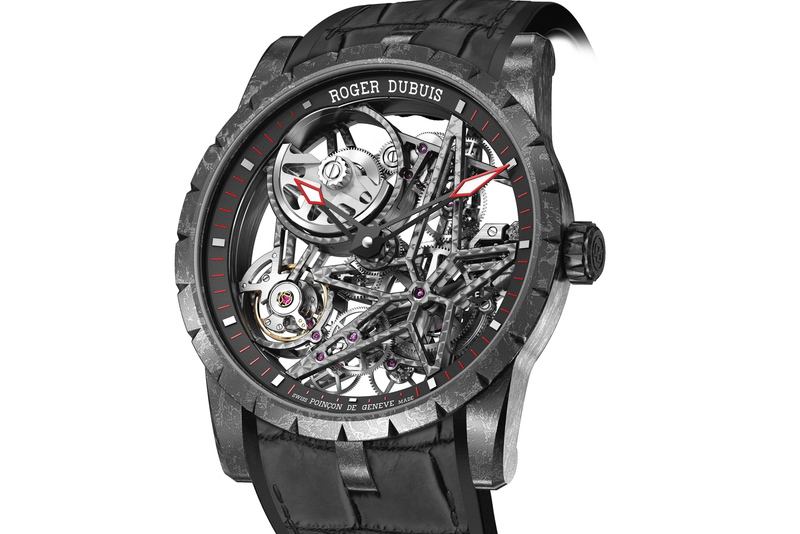 Roger Dubuis create timepieces for those seeking individuality and who do not seek to follow convention. The appearance of the watch may not be to everyone’s taste but I applaud the brave styling. I do not wish to wear the same watch as marketing seduced lemmings who always seek the usual suspects. I would gladly wear a Roger Dubuis. A 30 minute chrono-counter is located at 3 o’clock. The subdial is blue, but snailed, providing contrast with the adjacent areas of the dial. Grey detailing and Arabic numerals convey data to the wearer cleanly. Symmetry is provided by a second subdial, located at 9 o’clock. This is used for subsidiary seconds and repeats the pattern of the aforementioned chrono-counter opposite. The subdials are large, readily legible and afford balance to the dial. A date aperture is located at 6 o’clock. Yet, typical of Roger Dubuis, it is not square or rectangular, but trapezoidal. The frame of the aperture mimics the profile of the Roman numeral at 6 o’clock. It is this attention to detail which distinguishes Roger Dubuis from some of the more pedestrian brands. All aspects of the design are honed to an elevated level. Hours and minutes are conveyed with silver coloured sword-shaped hands. The warrior-like symbolism is never far away. This colour is repeated for the subsidiary seconds. However, the hands on the central chrono seconds and 30 minute chrono-counter are depicted in black. The judicious use of colour differentiates the current time from the chronograph functions. The 42mm case diameter is not unduly small, nor excessively large, and should prove suitable for a broad array of wearers. Whilst I usually favour cases made of gold, the steel case sympathetically blends with the blue dial. Moreover, the absence of noble metal makes the watch more accessible. I am fond of the design of existing Excalibur models. The fluted bezel reminds me of the castellated walls of a medieval fortress. The triple horns, joining the black hand-stitched leather strap to the case, look purposeful and stylish. They have a muscular, rugged appearance reinforcing the masculinity of the watch. The bezel is highly polished, providing contradistinction with the satin brushed caseband and lugs. Rectangular shaped push pieces have wonderful bevelled edges, similar in flawless form to the anglage exampled on the movement. The crown is charmingly detailed with multiple angles toying with light. 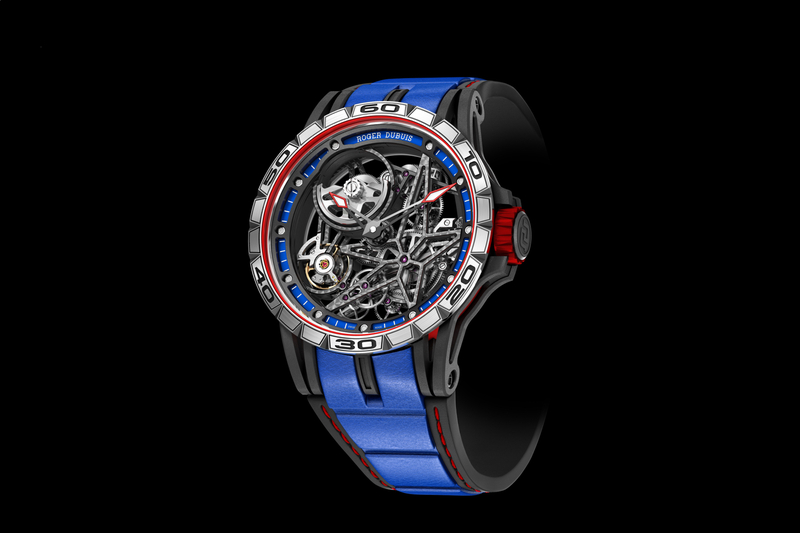 It bears the Roger Dubuis logo on its vertical flank. Roger Dubuis are masters of manufacturing magnificent movements and it is gratifying that they indulge the wearer’s eyes with a sublime view courtesy of a sapphire caseback. 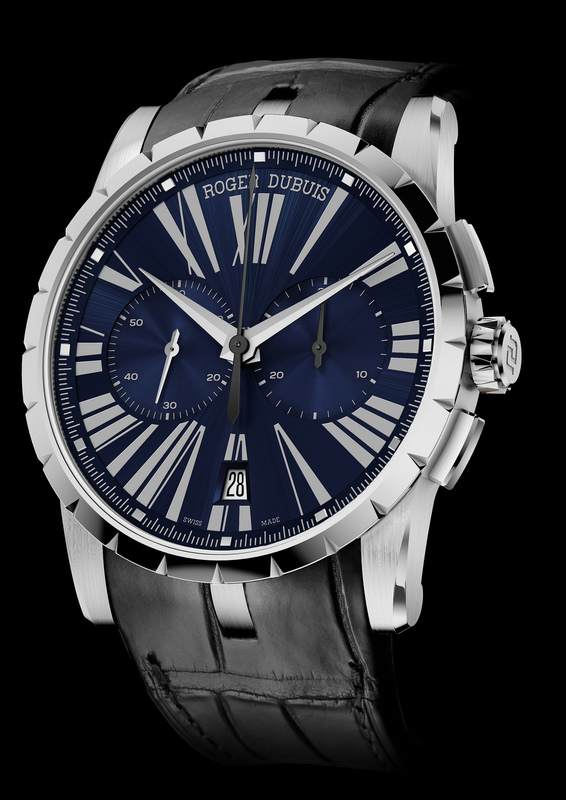 Roger Dubuis have created a new movement, the RD681, which resides in the Excalibur 42 Chronograph. The specification is impressive. It contains 44 jewels and 280 components. Furthermore, it has a column-wheel chronograph, typically found on the finest chronograph movements. Pressing the chrono-pushers will not adversely affect the rate keeping accuracy of the watch. I have visited the manufacture on the outskirts of Geneva and it is the breadth of talent and profound expertise which left an indelible impression on my mind. Poinçon de Genève, or the Hallmark of Geneva as it is sometimes referred, is a demanding criteria for a watch company to meet. It relies upon the watch company being subject to frequent inspections by Laboratoire d’Horlogerie et de Microtechnique de Genève (LHMG). This typically happens on a fortnightly basis. There is no room for compromise; the stringent criteria must be met or the hallmark can be withdrawn from the manufacture. Every detail is distilled to perfection. Beveling is blemish free and perfectly executed. Mirror polishing is the outcome of diligent and skilled abrasion against diamantine paper. Even the jewels are to a standard dictated by the LHMG. The RD681 has Côtes de Genève motif on the bridges. A micro-rotor captures the energy from the wearer’s wrist movements, automatically winding the watch. However, it does not obscure the beauty of the movement like a conventional rotor, much of the majestic detail is still readily visible. I felt blue at one point, knowing I wanted to write about this watch but being unable to find the elusive “hook” for my article. However, one look at the watch and all became clear. I would love to feel the blue dial reflect its azure appeal on my face and enjoy the obvious luxury this regal watch bestows to its fortunate wearer. Feeling blue? It’s a state of mind I would gladly wish to embrace courtesy of this august timepiece with its sublime style and exalted effectuation.